1996 Westmount College, Santa Barbara, CA. 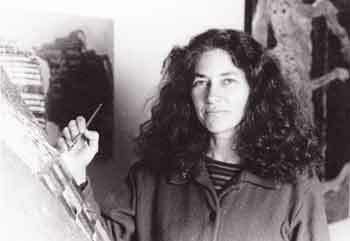 1987 Open Studios, Tribes Series, Mendocino Art Center, Mendocino, CA. 2000 Partners Gallery Invitational, Little River, CA. 1999 Igniting the Edge, Women's Caucus for Art, Artcore Gallery, Los Angeles,CA. 1986 Inaugural Exhibition, Center for the Visual Arts, Oakland, California. Crocker Kingsley Annual Exhibition, Sacramento, CA. 1994 The Creative Process Lecture Series, Willits Arts Commission, Willits, CA. 1984 Curator, Crocker Bank, Kaiser Center, Oakland, CA. 1989-90 College of the Redwoods, Instructor, "Art Marketing Techniques"